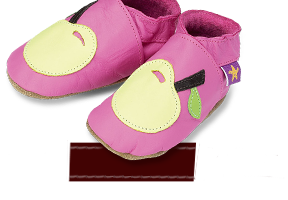 We have a great range of baby girls shoes available, from a variety of different colours and styles to suit your little one. Our fun animal magic collection includes the Ladybird Red shoe which has red leather and black suede in the design of a ladybird, and the Rabbit & Carrot in Sand shoe, which features a fluffy tail feature. We have baby girls shoes with seasonal themes, from Spring/Summer, which includes Cloud 9 On Turquoise with white clouds and Lilypad On Jade, with pink and fuchsia lilypad flowers. Through to Autumn/Winter, with SNUGS Chocolate Sheepskin Booties, featuring a toggle drawstring adjustment and our Autumn Chocolate, with an orange and caramel leave design. The Baby Love Baby range, make perfect gifts for little girls and come in a number of pretty designs. These include the Sweetheart Fushais Glitter, which is a soft leather shoe with a double heart design and fuchsia glitter, and the Applique Heart Pink shoes which have embroidered red hearts. We also have shoes for Christmas and Easter, including Snowflake White which has a silver snowflake design and Penguin Baby Blue which features a Penguin with a Yellow beak. All our girls footwear comes with free delivery in the UK.